��� The world of basketball is full of geometry. Every aspect of the game incorperates geometry in some way. The basketball court is a geometric goldmine. The backboard on a basketball court also uses geometry. Even the basketball ball itself has a bit of geometry in it. ��� A standard colligate basketball court measures 94 feet in length (sideline) and is 50 feet wide (baseline). The center circle measures 12 feet in diameter, while the smaller circle inside it has a diameter of 4 feet. The division line, which is 50 feet long, splits the court in half. This creates two half-courts, each measuring 50 feet wide by 47 feet long. 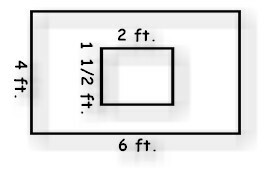 The free-throw lane measures 12 feet wide by 19 feet long. The 3-point arc is 19 feet 9 inches from the center of the basket (rim). ��� The backboard, which supports the rim, is four feet from the baseline. The rim is 18 inches in diameter, and is suspended exactly 10 feet above the floor. The backboard is 6 feet wide by four feet high. The white box above the rim of a backboard must be 18 inches high, and 2 feet wide. ��� The official basketball of both men's N.B.A. and N.C.A.A. leagues is a size 7. This ball has a diameter of apporimately 9 inches, and a total circumference close to 30 inches.